Is L Brands' Dividend Sustainable? L Brands owns iconic brand Victoria's Secret, but deteriorating fundamentals may put its dividend in danger. L Brands (NYSE:LB) has had a difficult 2018. The stock of the owner of brands including iconic lingerie brand Victoria's Secret and beauty retailer Bath & Body Works is down 43% for the year as of this writing, approaching 52-week lows after a weak first-quarter earnings report. The 2018 downturn has pushed the company's forward price-to-earnings ratio to just over 10, and the company's dividend yield up over 7.5%. With L Brands possessing such an iconic brand in Victoria's Secret and at such a low valuation, some may wonder if now may be the time to pull the trigger on this beaten-down stock. Is the dividend safe? L Brands reported first-quarter results in late May that beat revenue expectations at $2.63 billion, yet missed earnings per share (EPS) expectations ($0.17 versus $0.18 estimates). In addition, the company lowered full-year 2018 EPS expectations, from the previous range of $2.95 to $3.25 to between $2.70 and $3.00 per share. Should investors be worried about L Brands' payout? Image source: Getty Images. While L Brands did, in fact, return to revenue growth last quarter, it was coming off a rather down year in 2017, meaning that L Brands is still making roughly the same amount of sales it did two years ago. *In millions. Data source: L Brands. But while the company's overall revenue has been stabilizing, it's taken more and more square footage to produce the same amount of sales. 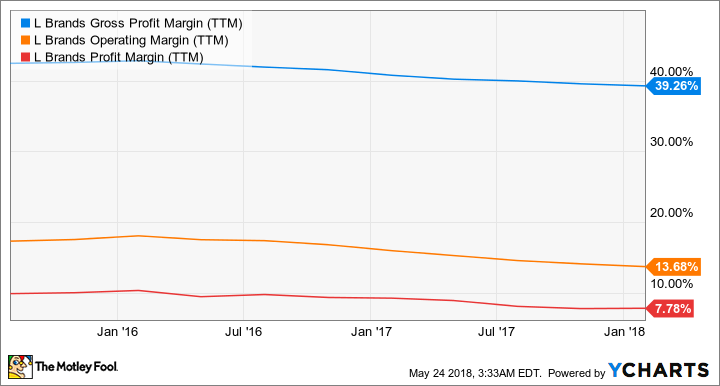 That's put L Brands' margins under pressure, with gross margins, operating margins, and net income margins all deteriorating consistently over the past few years. This could mean that the company's brands no longer commands the same premium, or that it may require more marketing to generate the same amount of sales. Either way, it's not a great sign for the company. For the first quarter of 2018, L Brands reported Victoria's Secret sales in the U.S. and Canada of $1.6 billion (60% of total) and Bath & Body Words sales in the U.S. and Canada of $760 million (30% of total). Currently, L Brands pays out $2.40 per share in annual dividends, which is about 88% of the low end of this year's earnings per share guidance ($2.70). That's already cutting it close, and there are additional reasons to believe the dividend may be in further trouble. 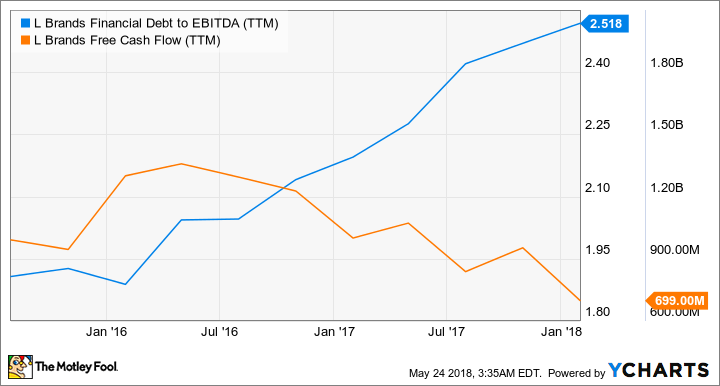 For instance, the company's free cash flow profile (operating cash flow minus capital expenditures) is actually lower than net profits, and barely above the current dividend payout. The company paid out $686 million in dividends last year, just barely underneath the $699 million in free cash flow the company earned in 2017. In addition, L Brands' debt load continues to creep up even as margins narrow, which has led to a rather rapid expansion of the company's debt-to-EBITDA ratio over the past few years. Thus, while the dividend is covered at the moment, the margin of safety between the dividend and both net income and free cash flow is very narrow. That means management needs to stabilize trends very soon, especially in the core Victoria's Secret brand, and figure out a way to get profits moving in the other direction. Like many retailers, L Brands is looking to improve results through more direct online sales offsetting physical store sales declines, and is also looking to China for international growth. However, so far these growth seeds have yet to offset larger declines in L Brands' core brick-and-mortar businesses. 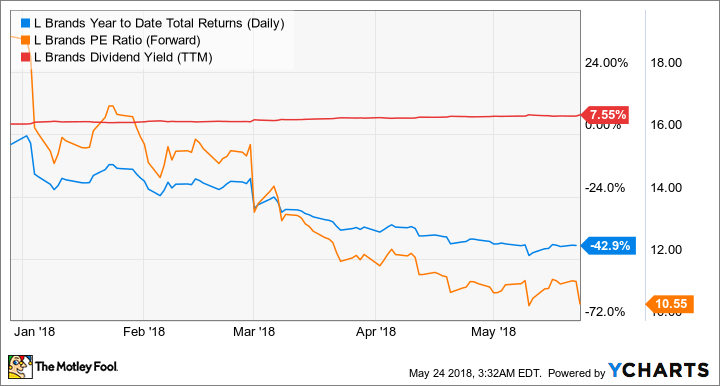 If the online and international businesses take off and the core business stabilizes in a strong consumer environment, L Brands could end up being a bargain, but if current trends continue, investors could be in for a nasty dividend cut. Until I see proof of a turnaround, I'm steering clear.